I adore my son. I do. He is a delight, truly. He is also 6 years old, and quite a lot younger than his sisters, so keeping him occupied in ways that also keep him out of trouble and away from the television can be challenging some days. He's lots of fun, and also very busy, very smart, and constantly looking for "projects." When my dad was here a couple of months ago, he built some frames from PVC pipe and then covered them with critter netting, to help keep rabbits and other hungry beasties out of my raised garden beds. So far, so good. The bean and pepper plants are growing and nothing seems to have bothered them so far. When he was finished with the frames, he had some leftover pipe, so he cut it into pieces for my son to play with. My husband purchased a bag of connectors and a bag of end covers, and he has been building things with them ever since. 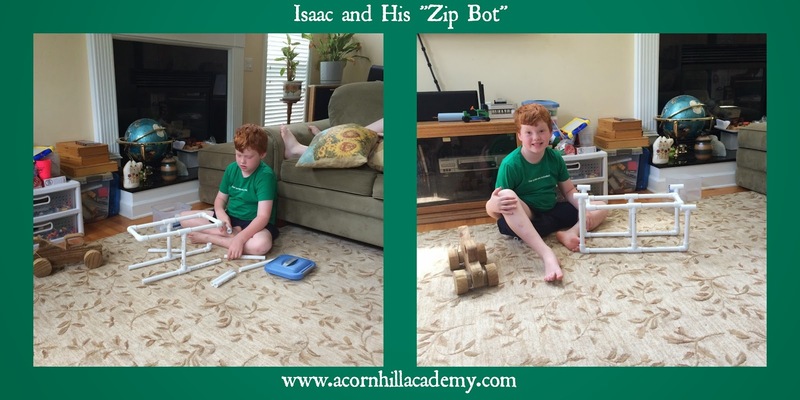 He builds robots and all kinds of things. He has a great imagination and tells me about his many different constructions. The possibilities are endless, really. In the picture below, he told me, "This is a zipline robot, or zip bot for short." I am not sure how it works, exactly, but Isaac liked it. Why am I telling you this? 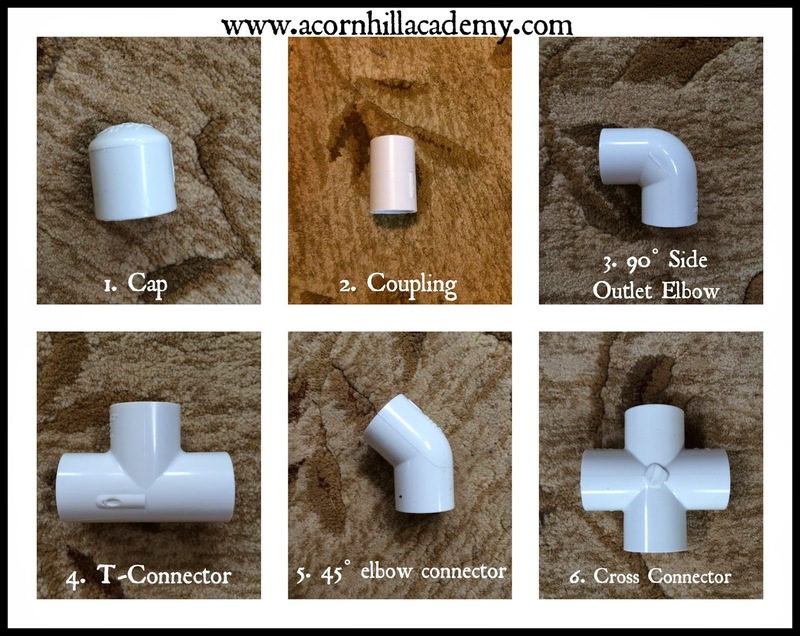 Well, PVC pipe is inexpensive. If you have a hacksaw (or a PVC pipe cutter, or a miter saw), you can cut it into pieces and have a fun set of building toys for your children. 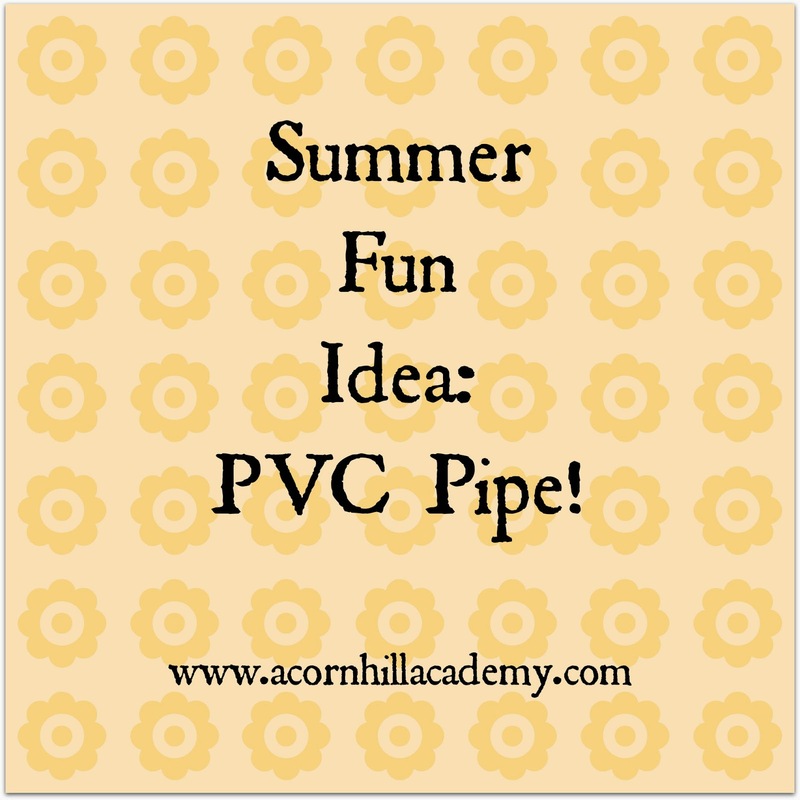 A friend of mine was asking recently what our favorite rainy day activities are, and I remembered how much fun my little man has had with PVC pipe, so I thought I'd share! We have had his little PVC collection out since my dad cut the pieces, but it would be a great thing to tuck away and keep for a rainy day, too. You can also send them outside with their pipe collection - I don't believe anything adverse would happen if they were left in the rain or used in the dirt. My dad didn't use any rhyme or reason when he cut up the extra PVC for Isaac, so he has random lengths, and he does a great job building with them. I talked with my husband the engineer, and he said if he were going to do it purposefully, he would cut some 12" lengths and some 5.5" lengths. I measured, and when you put the pieces together with connectors, it adds an inch to the total length, so if you were to cut the 5.5" pieces it would help accommodate for the extra length from the connectors. Isaac's had such a good time with his pipes, I'm making a set for my nephew for his birthday. I hope you can take this idea and have fun with it too! Ooooh, PVC pipes are great! I used to give these to my preschool group to play with. So many awesome things can be done with this open-ended material. Thanks for the reminder... I'll have to do this with my girls.